22 Comments This post may contain affiliate links. 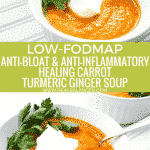 This Low-FODMAP Anti-Bloat and Anti-Inflammatory Healing Carrot Turmeric Ginger Soup is a delicious, wholesome, and warming soup that will soothe your stomach and keep you satiated. I love soup. A LOT. Not only is it delicious and warming, it’s also a great meal option on days where your stomach is a little upset or having trouble digesting. Why? Well, the first reason is pretty straightforward: soups are traditionally served warm, which is much easier for our bodies to digest. Warm foods open up the digestive channels and allow our system a little break from working to break down cold, raw foods. Now, don’t get us wrong, cold, raw meals like salads are great for you, but everyone always has those days where their stomachs are over-working from a previous meal. Plus, warm food on a chilly day is such a nice treat. This soup is particularly beneficial as it contains multiple ingredients that aid in the digestion process. This soup contains ingredients that are considered by Monash University to be low-FODMAP. Low-FODMAP is a way of identifying specific foods that contain high levels of FODMAPs. 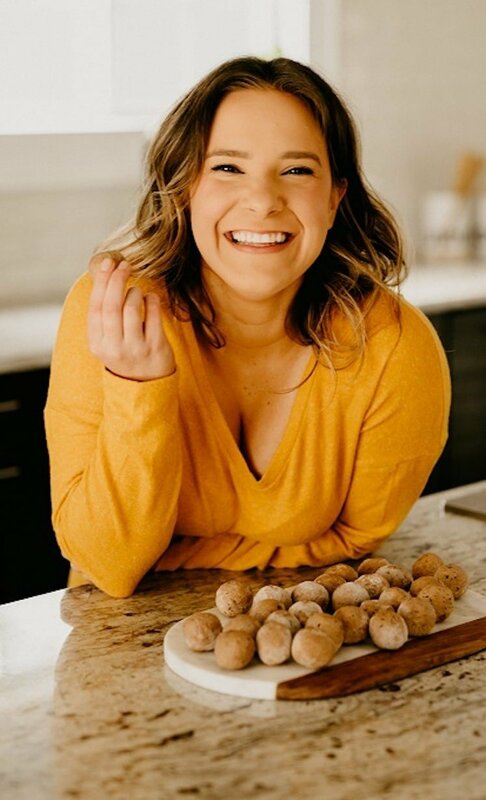 FODMAP is an acronym that stands for Fermentable Oligosaccharides, Disaccharides, Monosaccharides, and Polyols, which are all short-chained carbohydrates that are poorly absorbed and can wreak havoc on your digestive system. When a food that is high in a particular FODMAP is consumed, it passes through the stomach and small intestine and is either fermented by colonic bacteria releasing gas or expelled together with fluid, thus resulting in symptoms of IBS in people with a sensitive gut. A low-FODMAP diet is highly recommended by medical professionals for people experiencing gastrointestinal distress, such as Irritable Bowel Syndrome (IBS). In the United States alone, it is estimated that between 25 million and 45 million people suffer from IBS. Rather than taking a myriad of prescription medicine to deal with the symptoms caused by IBS, a low-FODMAP diet has been found to be extraordinarily helpful in dealing with the distress of the syndrome. To follow the diet and reduce or altogether eliminate symptoms of IBS and other sensitive gut issues, simply remove high-FODMAP foods from your diet. What foods are considered high-FODMAP? Check out this link here or, if you’d like a searchable, easy-to-use list, download the Monash Low-FODMAP phone app. The ingredients in this recipe all contain anti-bloat and anti-inflammatory benefits. This is especially important for people with gastrointestinal issues but is helpful to anyone who is experiencing bloating or inflammation. Carrots, especially when cooked, are easier than most vegetables to digest. Due to their soluble fiber content and their low levels of FODMAPs, they are traditionally easier on the gastrointestinal system than other vegetables, such as asparagus (high in fructose), beets (high in oligos), and cauliflower (high in polyols). If there is a spice that you should be eating everyday, it’s turmeric. This spice is common in Indian and Middle Eastern dishes and it enhances any meal its added to. Turmeric is incredibly beneficial to your diet as it contains a plethora of anti-inflammatory and anti-bloating properties. In one study, researchers gave people who were diagnosed with metabolic syndrome either one gram of turmeric or a placebo pill daily for eight weeks. The results of the study showed that those who were given turmeric had lower levels of inflammation. Because of this, turmeric is recommended to people with Inflammatory Bowel Disease (IBD), a disease that causes chronic inflammation in the digestive tract, such as Crohn’s disease and Ulcerative Colitis. Additionally, turmeric has been shown to stimulate bile, which allows the body to more easily absorb fats and certain nutrients, and to reduce gas and bloating, thereby calming the digestive system. Aside from the pop of flavor that ginger brings to a dish, its benefits for digestion cannot be stressed enough. This root has been used for more than 2,000 years to aid in digestion, reduce inflammation, treat stomach upset, nausea, arthritis, colic, diarrhea, and even heart conditions. A study conducted by the University of Miami suggests that ginger can be substituted for non-steroidal anti-inflammatory drugs (NSAIDs), such as Aleve and Tylenol. The study compared the effects of a highly concentrated ginger extract to that of a placebo in patients diagnosed with osteoarthritis of the knee. The study found that ginger reduced pain and stiffness in the knee joints of patients by 40% more than that of the placebo. We’ve all used cinnamon before. This spice provides a natural sweetness to any dish its added to! Cinnamon has a variety of health benefits and has been found to be useful in reducing inflammation. It also can lower blood sugar levels in people with diabetes, provide antioxidants, and fight bacteria. Homemade broth made from bones is one of the most healing foods you can add to your diet. Since it is a liquid, its easily digestible and full of beneficial minerals and nutrients, such as potassium, phosphorus, vitamin A, vitamin C, and iron. Broth is anti-inflammatory. This makes it a perfect option when you’re feeling sick as it can reduce the symptoms of upper respiratory infections. This is why Grandma always made you chicken noodle soup when you were sick! It is a healing and comforting meal, especially when it’s cooked in homemade broth. 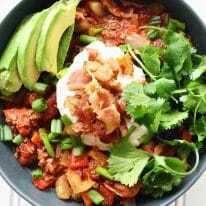 This recipe is low-FODMAP, paleo, Whole30 compliant, gluten-free, grain-free, dairy-free, vegetarian, and sugar-free. 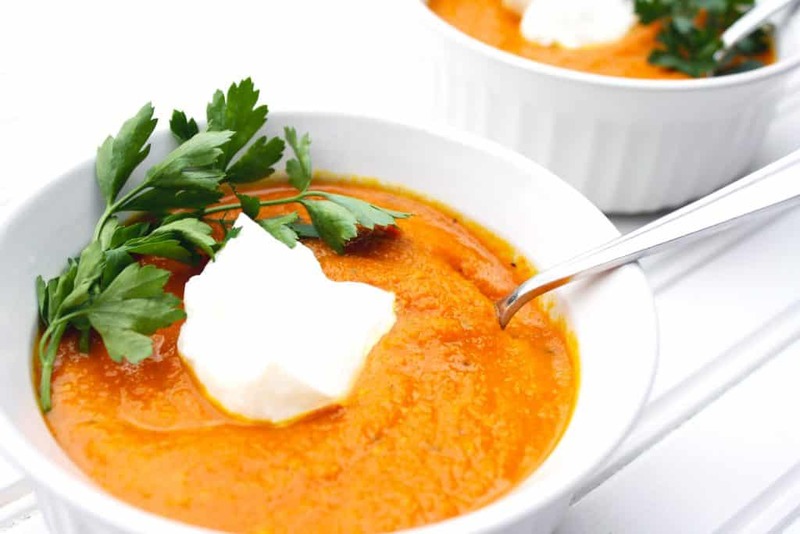 This Low-FODMAP Anti-Bloat and Anti-Inflammatory Healing Carrot Turmeric Ginger Soup is a delicious, wholesome, and warming soup that will sooth your stomach and keep you satiated. 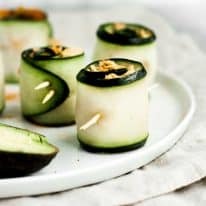 This recipe is low-FODMAP, paleo, Whole30 compliant, gluten-free, grain-free, dairy-free, vegetarian, and sugar-free. Depending on thickness of peeled carrots, cut them in half lengthwise and widthwise. If they are already pretty thin, just cut in half lengthwise. 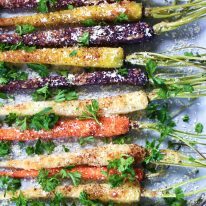 Place carrots on baking sheet and drizzle with olive oil. Roast carrots in oven until tender, about 20 minutes. In a food processor, add all ingredients. Blend on high until well-combined. 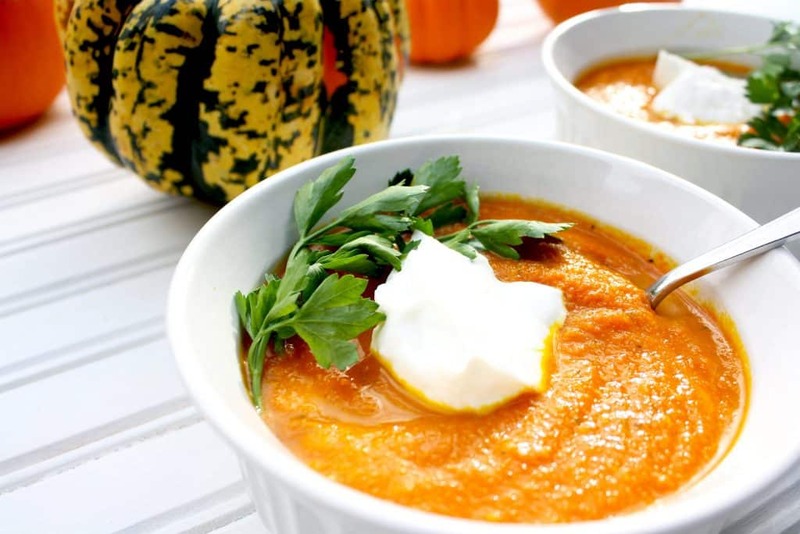 This soup is absolutely delicious and wonderful for those with digestive issues. The only reason I gave it 4 stars instead of 5 is because the instructions are not great, especially if you want to try to make a double batch, which would not fit in a food processor. What the heck is a “thumb” of ginger? Whose thumb? Anyway, here’s how I made a double batch (doubling all ingredients): Cut the unpeeled carrots into rounds and roasted them as directed. Put them in a dutch oven on stovetop with all other ingredients. I just guessed at the ginger based on how much I thought I’d like, and I diced it before adding it to soup. Brought the soup to a low boil, then simmered on stove for 1/2 hr. on low. Blended with an immersion blender, added salt and pepper, and juice of one lemon at end. Lovely soup. Have you made this in the Instant Pot? Since this soup doesn’t require any stovetop cooking, using an Instant Pot wouldn’t really be needed, especially since the flavor that roasting the carrots creates really enhances the soup. 🙂 I’d suggest sticking with the recipe instructions for this one.